Alison Papazian graduated from James Madison University in Virginia with Bachelor of Science degree in Elementary Education and received her Masters in Reading from Eastern Michigan University. She has experience as a classroom teacher, special education teacher, teacher consultant, reading specialist, and private tutor. She has been teaching for over twenty years! Mrs. Papazian has taught around the country and is passionate about working with children. Mrs. Papazian lives in Ashburn Farm with her family. She is happily married and has two daughters. Mrs. Papazian’s favorite pastime is reading on the beach with her family. Donna White received a Bachelor of Science Degree in Education and Theater Arts from The State University of New York at Oneonta, and a Masters Degree in Reading Education from Longwood University in Virginia. She has over 20 years of experience teaching in Chesterfield County, Bedford County, and Henrico County in Virginia, as well as Houson,TX. 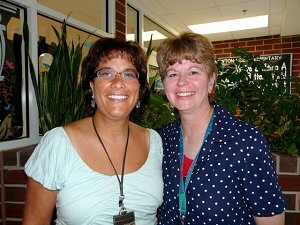 In 2009, she received her National Board Certification in Reading and Literacy. She lives in Winchester, VA with her husband and two teenage sons. Mrs. White's favorite pastime is spending time with Mrs. Papazian, talking about teaching, and books!